The Yo-Yo Intermittent Recovery Test (YYIRT) is one of the most widely used fitness testing protocols in team field sports. It was developed to measure the ability of athletes to repeat high-intensity aerobic bouts, and has been shown to be valid and reliable in predicting VO2 max and aerobic power (3). Because of its popularity, a large amount of normative data exists making it easy to compare an athlete’s scores and create performance standards based on similar-level athletes. In the context of team sport, specifically at the collegiate level, coaches often use the YYIRT as a way to assess their athletes’ readiness to return to pre-season training with the team. A score is typically set at a level that ensures players who pass are fit enough to handle the rigors of sometimes multiple practices in a day. As someone who trains athletes like this in the months leading up to their season, I hear a lot of variability in the standard for score that each of their respective coaches set – some more easily attained than others. The sport I work with in this context the most, by far, is soccer, and while a slew of other fitness test are loved by coaches, the YYIRT remains a common language. For my purposes here, I’ll speak in the context of soccer unless otherwise noted. It was already stated that the YYIRT is a reliable test for predicting VO2 max and aerobic power, but it only indirectly predicts an athlete’s capacity to play soccer. While both the test and the game of soccer share that they are intermittent in nature, largely aerobic, and involve change of direction (COD), there is just no way to perfectly replicate the specific type of fitness necessary on the pitch. What we have, then, are athletes who end up training specifically for a test that only indirectly correlates with their ability to play the game. Generally, we can say that a very good score on the YYIRT is only achieved by a very aerobically fit individual, and that this individual may hold an aerobic capacity above what they actually need for the game. The paradox is that it does matter how they got there. Running through the test repeatedly, for example, is not an adequate way to train for soccer, although it will likely lead to improvements in test score. There are a few qualities, however, that are important for soccer and many other field sports, that just-so-happen to translate to improving performance on the YYIRT as well. Aerobic power is defined as the highest amount of oxygen an athlete can consume during maximal exercise (1). Because of this, it is often referred to as VO2 max, or the mechanical power output at VO2 max. Put simply, it indicates the ability of the aerobic system to support high intensity exercise. Once an athlete’s ability to remain aerobic through oxygen consumption diminishes, further continuation of exercise is short-lived as the athlete is now producing energy primarily through anaerobic glycolysis and becomes backed up with lactic acid. The game of soccer is largely aerobic with intermittent bouts of high-intensity running. It is the high-intensity runs that stress the ability to remain aerobic throughout the match, with the athlete’s aerobic power essentially dictating how well this is accomplished. The YYIRT is also a test of increasing-intensity runs separated by 10 second walking rest intervals. During the test, the athlete relies on their aerobic system to consume and utilize oxygen as a substrate and keep from accumulating more acidity than the body can voluntarily operate through. When the peak of oxygen consumption is reached as the intensity of the runs increases, anaerobic glycolysis takes over and the end of the test is eminent. We can then say that aerobic power is largely deterministic of performance on the YYIRT as well. Since aerobic power is a common denominator between the testing protocol and the sport, it is necessary to determine the best way to develop this quality. For this matter, few protocols are more effective than Maximal Aerobic Speed (MAS) training. As is always the case, the way it is administered is important, but generally MAS protocols involve high-intensity aerobic intervals, with work-to-rest ratios ranging from 1:1 to 2:1, at a specifically prescribed and individualized speed. An athlete’s maximal aerobic speed (in m/s) is simply the slowest speed at which VO2 max occurs. It is commonly found through continuous runs of 1.5 to 2 kilometers, or from speeds reached during intermittent fitness tests such as 30-15 or YYIRT (4). This value is typically used to prescribe intervals of around 15 seconds of work with equal rest at 100-120% of calculated MAS. Figure 1: Pattern A shows a simple set-up. Athletes may run forward from cone-1 to cone-2, backpedal back to cone-1, then run forward to cone-3 and back. The COD zone between cone-1 and cone-2 may also be replaced with a lateral shuffle. Pattern B shows the COD zone as a triangle in which the ahlete runs forward, shuffles across, and backpedals back to cone-1, finishing again with a straight ahead run down and back. In terms of administration, it is important to consider the demands of the sport we are actually trying to train for. The YYIRT involves one change of direction per repetition, preceded and followed by a straight ahead 20 meter run, but the game of soccer is much more non-linear and involves countless more cutting efforts. Typical MAS protocols involve a straight ahead run to a distance determined by the athlete’s speed, and while this makes it easy to prescribe, it does little to replicate the demands of the sport. One way to modify the protocol is by breaking the distance up into two sections. The first is a smaller, ‘change of direction’ zone followed by a longer ‘stride’ zone. Figure 1 shows two simple cone patterns through which variety can be added from set to set or one workout to the next. The COD zone on the left essentially acts as a small agility pattern, while the stride zone is simply a 20-meter run, down and back. These patterns end up working quite well for a 15-second interval, and can be modified easily by adjusting the size of the COD zone. 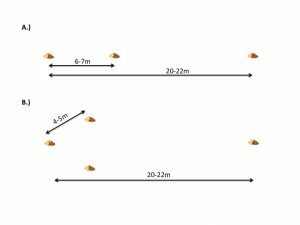 Of course, an athlete will not be able to achieve their MAS through a small agility sequence, but I have found that the average speed during the 20-meter segment does match or exceed MAS even with the acceleration and deceleration associated with a down-and-back run. What we end up with is a slightly shorter but equally intense 15-second interval that is not only appropriate to typically prescribed speeds, but an appropriate parallel to the nature of the sport. Anaerobic speed reserve (ASR) is the second variable related to advancing performance on the YYIRT, with high carry-over to the field of play. ASR is essentially the difference between an athlete’s absolute maximum speed and their maximum aerobic speed. Athletes with higher max speed capability are able to operate at a lower relative intensity than others, given the same sub-maximal workload. While aerobic power supports the ability to repeatedly use maximum speed, improving anaerobic speed reserve by way of increasing max velocity allows an athlete to express their aerobic capabilities to a greater extent. The significance of this is that faster top-end speed can precede faster MAS, but the opposite is rarely the case. In other words, repeatedly running sub-maximally will not improve top speed, but increasing top speed can improve the ability to repeatedly run sub-maximally. The translation to performance on the YYIRT should be obvious since the running speed increases as the test progresses, so individuals with greater max speed have, at the very least, a higher potential to reach later stages. There are two main aspects of speed reserve that need addressed. The first is improving maximal speed by way of training a-lactic power. This type of training involves full speed sprinting to varying distances, with 10-30 meters being common for field sports. A-lactic power, by nature, necessitates long rest periods to ensure that each repetition is of high effort and quality. An example of a simple speed development session could be 10-12 x 20 meter sprints, with 2 minutes of rest between each repetition. Each sprint should be of maximal intensity, allowing only minimal decrement in speed in order to push the boundaries of the neuromuscular system. This type of acceleration work can be made more specific to sprint bouts that may occur during play by simply adding one or two changes of direction. 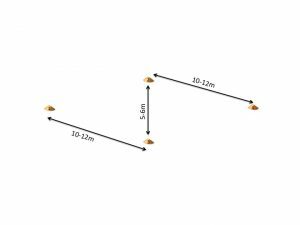 When doing this, keep in mind the total distance covered as well as distances between cuts. If the athlete is never able to accelerate further than 10 meters before a COD, it will be very hard to generate the speed necessary to improve maximum velocity. The second thing we need to address is some level of repeated sprint ability (RSA). While absolute speed directly effects the anaerobic speed reserve and is a critical factor in many scoring attempts in field sports such as soccer, it will hold much less value without the ability to repeat on demand. Similarly, during the YYIRT, being able to achieve the speed required for the later stages of the test is of little importance without the ability to get through multiple reps of each speed leading up to it. Figure 2: This pattern involves only forward running throughout. Athletes sprint from cone-1 to cone-2, cut across to cone-3 and up to cone-4, finishing with a sprint back down through the center of the pattern. I look for athletes to finish this drill at full speed around 9 seconds, allowing up to 30 seconds rest, and repeating for two sets of up to 8 repetitions. Training for repeated sprint ability is constituted by short bursts (<10 sec) of high-intensity running followed by relatively incomplete rest periods (<60 sec). Recently, the effects of two different work-to-rest ratios on 20 meter sprint and YYIRT performance were studied by Marcello et. al. Both protocols improved both tests, but a 1:3 ratio had greater effect on the YYIRT score, while a 1:6 ratio improved 20-meter performance to a greater extent (2). Researchers often test straight-ahead sprints of around 30 meters for their studies, but keeping intensity and work-to-rest ratios the same we can again move toward sport similarity by adding changes of direction. Figure 2 illustrates a common pattern that I use with soccer players when the program has progressed enough to add COD. The goal of RSA training, no matter the variation, is to complete a highly a-lactic anaerobic bout, then stress the aerobic system’s ability to support subsequent repetition. The density of a set should be adjusted to a point where the completion time of each rep is kept within a small window of decrement, not allowing for significant buildup of glycolytic by-product. In many ways, repeated sprint ability protocols look to accomplish the same thing as maximal aerobic speed protocols. The main idea is to repeat high intensity exercise and stay aerobic as long as possible. MAS does this with more sustainable speeds and shorter recoveries, while RSA does it with high speeds and longer, but still incomplete, recoveries. The parallel to the YYIRT is that achieving excellence requires the ability to stay aerobic as long as possible. On the field of play, if an athlete is able to remain primarily in aerobic metabolism while still able to perform high-intensity bouts throughout, they will surely have an edge on competition. As many researches will know, an important consideration to account for during any protocol is test familiarity. Keeping all other factors the same, two athletes may perform quite differently if one has experience with the test and the other does not. With the YYIRT, two standout things that can affect the efficiency of the athlete are appropriate pacing and familiarity with the audio (there are many versions). Other little things that help more experienced individuals include using both legs equally to make cuts throughout the test, and just knowing the feeling of continuing to run into deep fatigue. While these may seem like ways to ‘cheat’ the system, a test requires adequate performance, and if a standard is set that must be met, it is often these little things that can make the difference. It may be wise for your athletes to ‘practice’ the test a couple times. This does not necessarily need to be a maximal attempt or even viewed as a training tool. Running through the first 6-7 minutes of the test, even as a warm up, is simply an effective way to familiarize athletes with the task you are asking of them. The rest should be taken care of through proper training. One factor that could be further expanded upon is the idea of continuing to push into deep fatigue and lactic buildup, or ‘dead-legs’. If the YYIRT is being run to exhaustion for the purpose of finding a maximal score, it is hard – really hard. Most athletes tend to pull themselves from the test or miss paces when they look like they have at least a few more. It is not an easy thing, as an athlete, to push yourself to run 40 meters when you feel like you can’t breathe or feel your legs. More often than not there is at least a couple more repetitions in the tank, and some athletes are better at getting there than others. While I am not a big fan of ‘mental toughness’ training, I do advocate creating environments of intrinsic motivation and reducing fearfulness and anxiety levels. For some reason, some athletes get so nervous for this test that their heart rate is 80% of max before they even step up to the line. They psych themselves out even when they’re physically prepared to do well. Some individuals feed off of competition and the thought of out-doing someone else’s score – these are the athletes that you can excite, who might benefit from a build up the importance of the test. Others may need the exact opposite. They benefit from downplaying the scenario as an external reduction of their anxiety. The main idea here is that psychological motivation, no matter which end of the spectrum, is an important consideration for YYIRT preparation. While these methods aren’t the only way to train for soccer or the only protocols to improve YYIRT scores, I highlight them here because of the high physiological crossover and their ability to be modified for the purpose of sport similarity. When planning to train for the YYIRT in a sensible way, these are the main things to consider. Always remember that, regardless of the test your athlete needs to pass, the game they wish to play is the top priority. Sport coaches should be aware that, even if they set an unrealistically high standard as a way to motivate incoming athletes, they might end up with individuals who are more prepared to pass a test than they are to play a sport. The fact is that most athletes will be more concerned with their ability to pass the test than perform at practice. All professionals in performance enhancement positions should then be advised to stress the importance of the necessary qualities of their athletes, proper training for those qualities, and the prioritization sport skill and fitness over test readiness. Ekblom, B. “Factors Determining Maximal Aerobic Power.” The Scandinavian Physiological Society, no. 556, ser. 15-9, 1986. 15-9, www.ncbi.nlm.nih.gov/pubmed/3471053. Iaia, FM. “Short- or Long-Rest Intervals during Repeated-Sprint Training in Soccer?”PLOS.org, 15 Feb. 2017, doi:https://doi.org/10.1371/journal.pone.0171462. Krustrup, P. “The Yo-Yo Intermittent Recovery Test: Physiological Response, Reliability, and Validity.” Medicine and Science in Sport and Exercise, vol. 35, no. 4, Apr. 2003, pp. 697–705. PubMed.gov, www.ncbi.nlm.nih.gov/pubmed/12673156. “Maximal Aerobic Speed (MAS).” Science for Sport, www.scienceforsport.com/maximal-aerobic-speed-mas/. Greg Gustin is the Assistant Performance Director at Athletic Lab and the Assistant Fitness Coach for the North Carolina Courage and North Carolina FC. Greg has a BS in Exercise Science and MS in Health and Fitness. Greg is recognized as a Certified Strength and Conditioning Specialist (CSCS) by the National Strength and Conditioning Association and a Level 1 Coach by USA Track & Field. Great article, thank you for sharing your knowledge. For the MAS workout (15sec work, 1:1 work:rest), what set/rep or total duration would you recommend? Hi Rob. Thanks for the read. For MAS, I typically use 2-3 sets of 8 reps as a standard starting point with about 3 minutes rest between sets. Over time I will progress volume up as high as 3×12, then from there if it needs to progress further you can play more with the course making it longer/more challenging through the “change of direction” zone.